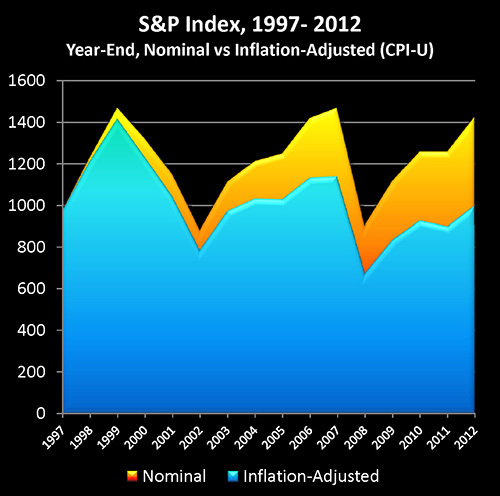 The explanation of the mystery can be found in the graph above, which is based upon historical performance of the Standard & Poor's 500 index from the end of 1997 through the end of the 2012, as well as official US government inflation statistics for those same 15 years. As such, the graph should act as a reasonable proxy for the real world long term performance results achieved by tens of millions of American investors during those years. As we will explore, the ultimate bottom line number of what our investments will buy for us after we've paid our taxes has been dominated by something that few average individual investors fully understand, which is the powerful and deceptive relationship between inflation and taxes. What may come as a particular surprise is that these dramatic results are entirely based upon the officially reported 2.42% average rate of inflation over the 15 years. If our personal experience with increases in prices leads us to suspect a higher real inflation rate, then real world performance becomes even worse than what is shown herein. 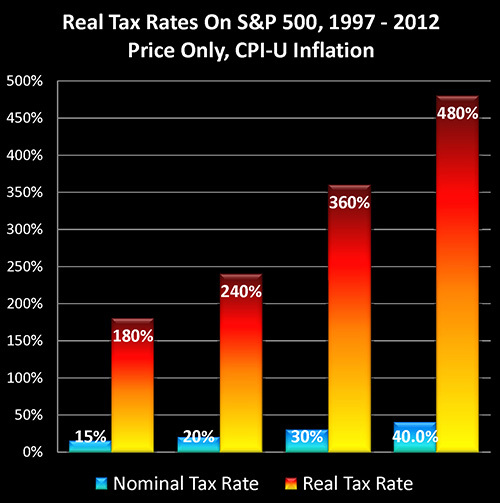 As shown in the above graph, inflation creates "Stealth Taxes" on stocks, which are far higher than stated tax rates, and which slash real after-tax stock returns. These hidden taxes aren't a line item in either brokerage statements or tax returns, but they have in fact consumed much of the purchasing power of long-term investment profits – and retirement plans – for an entire nation. When it comes to long-term stock performance since the late 1990s, while paper gains may look impressive, there are in fact three levels of illusion, as covered in three interrelated articles of mine. This is the third article in the series, and can be read on its own without having read the other two, but the complete picture can best be seen when all three are considered together. The first level of illusion has to do with real price gains. And as explored in, "How Financial Reality Is Hidden By Commonly Used Theory And Jargon", in point of fact when it comes to the two largest components of net worth for US citizens – stocks and home values – real changes in price levels have been negative for the 22 out of 40 years studied between 1972 and 2012. 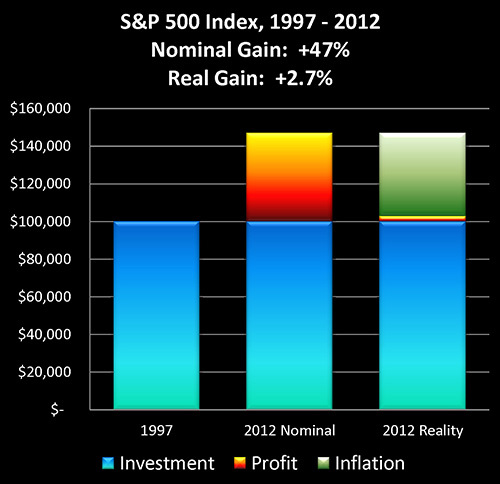 The second level of illusion is discussed in "Creating Wealth With Stocks: Expectations Versus The New Reality", which is when we look at the long-term compounding of wealth in the stock market since the end of 1997, while on the surface the results look reasonably good, the bottom line was actually a failure to deliver 65% of the results that were expected by long-term investors as well as pension funds. Having two thirds of their expected pre-tax wealth gains go missing for 15 years in the critical later years of their working career is, in reality-based terms, a major explanation for why so many people are no longer retiring when they had expected to, despite decades of disciplined savings and investments. The third illusion has to do with what real tax rates are on after-inflation income. To understand what is happening, let's begin by taking a look at the graph and chart below for the Standard & Poor's 500 between the end of 1997 and the end of 2012. 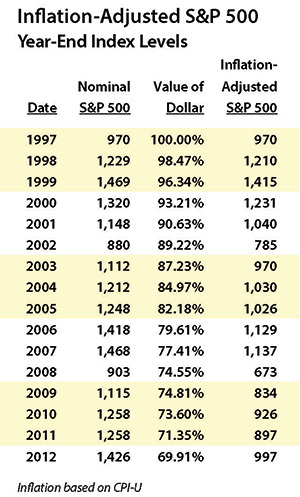 The Standard & Poor's 500 at the end of 1997 had a value of 970, and by the end of 2012 had reached a value of 1426 (as shown in yellow), which was in nominal terms a quite impressive gain of 47%. However, once we adjust for changes in the purchasing power of the dollar, then using official US government inflation statistics (the CPI-U as calculated by the Bureau of Labor Statistics), a dollar by the end of 2012 would only purchase what 69.9 cents would have purchased 15 years before. So when we take our ending index value of 1426, and we adjust for the change in purchasing power, our ending purchasing power is only 997 (as shown in blue), or a gain of 27. However, even though it is governmental monetary and fiscal policy that creates inflation, the Internal Revenue Service does not recognize the existence of inflation when it comes to taxes on investment gains. Assuming we started with an initial investment of $100,000, if the stocks in our portfolio performed exactly like the stocks comprising the S&P 500, then on a price-only basis our ending portfolio value would have been $146,965. Subtracting the initial investment leaves us with $46,965 in profits, as shown in the dark blue bar on the above graph and line (2) on the chart. When we take the declining purchasing power of the dollar into account, it turns out that $44,228 of our "profit", is really just keeping up with inflation. (The red bar and line 3.) To find this number we start with our ending portfolio balance of $146,965, and we adjust for inflation by multiplying by 69.91%, for an end result of $102,737, which is the real value of our portfolio in inflation-adjusted dollars, with the difference between $146,965 and $102,737 being $44,228. The four right-hand columns in the chart are for varying tax rate assumptions, on a combined state and federal basis. We will be using the assumption of a 30% tax rate for this walk-through. Now even though inflation is caused by the government through a combination of fiscal and monetary policy, the Internal Revenue Service does not recognize inflation as a deduction. Therefore, it treats the entire $46,965 shown in line 2 as being taxable income. When we apply a 30% tax rate (assumed combined federal and state marginal rates) to this, we come up with $14,089 in taxes due, as shown in line 5, as well as the purple bar of the graph. Because we are looking at real profits in inflation-adjusted terms (the value of the dollar at the end of 1997), we need to also look at taxes in terms of 1997 dollars in order to keep an "apples to apples" comparison. Multiplying the 2012 taxes by our inflation deflator of 69.9%, gives us real taxes of $9,849, as shown in line 6 and the aqua colored bar. When we subtract these inflation-adjusted taxes (line 6) from our inflation-adjusted income (line 4), we find that the real after-inflation and after-tax bottom line is a loss of $7,112. On a reality basis, then, we didn't make 47% – but rather we lost 7% of our original investment. 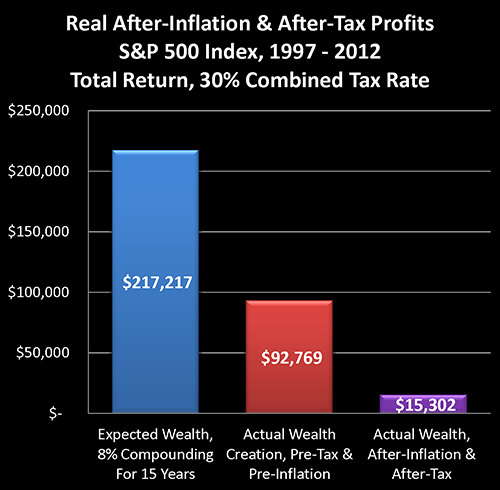 A 100% income tax rate on real (after-inflation) profits would have taken our entire 2.7% in real profits, leaving us at breakeven. With a 7% loss, however, we did worse than break even. Therefore, our real tax rate must actually be higher than 100% of our real income. When we divide real taxes (line 6), into real income (line 4), we get the real tax rate on real income. For our 30% tax rate example, then, we divide $9,849 in inflation-adjusted taxes by $2,737 of inflation-adjusted income, and perhaps to our surprise, we find that our real tax rate is 360%, as shown in line 8 of the chart, and also illustrated in the graph above. As further shown in the chart and graph, for the 15 years analyzed and looking at actual price changes in the Standard & Poor's 500 index, a 15% stated tax rate translated into a real tax rate of 180%, while a 20% stated tax rate translated into a 240% real tax rate, and a 40% marginal (federal and state) stated tax rate became a 480% real tax rate. Fully taking inflation and stock index price changes into account, the real impact of the increase in the long-term capital gains tax rate in the United States wasn't to go from 15% to 20%, but rather from 180% to 240%. The real tax rates may look fantastically high when compared to stated tax rates, but the source is easy to see – once we know what to look for. 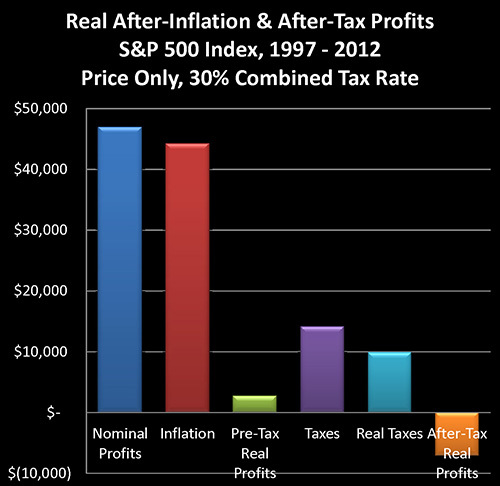 Simply return to our "Real After-Inflation And After-Tax Profits" graph and visually compare the towering size of the red "Inflation" bar, to the thin little sliver of the green "Pre-Tax Real Profits" bar. It's not just that impressive looking price gains were almost entirely based on the destruction of the value of the dollar hiding miniscule real returns, but worse – that illusion of income is fully taxable. The red bar in the graph above is every bit as taxable as the green bar. And once income taxes are paid on the towering phantom income of inflation, the result is that all of our real income was taken by the government, and a great deal more besides. So when inflation-based "profits" widely exceed real profits, there is a compounding effect on real tax rates that greatly exceeds the stated increase in tax rates. Which is why real capital gains tax rates rose by 60% for the period analyzed, rather than the stated 5% increase. If financial reality is defined (as it should be) as what our investment profits will buy for us after we've paid our taxes, then for the 15 years analyzed – reality simply hasn't been working the way most investors think it has been. Discuss two major implications of this type of analysis for investors.